Declan O’Sullivan serves as a Partner and Managing Partner of Dechert’s Dublin Office. Prior to that, Declan served as a Partner at William Fry since 2000. He qualified as a solicitor in 1992 and joined the Asset Management and Investment Funds team at William Fry in 1995. He has extensive experience in the establishment and authorisation of all types of investment funds including UCITS, hedge funds, property funds and private equity fund products. In addition, he has advised in the establishment in Ireland and continues to represent many leading fund service providers. He is the Chairperson of the Alternative Investments Committee of the Irish Funds Industry Association, a member of the European Commission Expert Group on Open Ended Real Estate Funds and AIMA. He was appointed a Notary Public in November 2007. I chair the basis.point Fundraising Committee and therefore am tasked with heading up basis.point’s fund raising efforts. Having decided to set up a charity, we had two key questions to answer – how do we raise money and who do we give it do? For fundraising, we wanted to try a different approach from the traditional “event driven” method of fund raising. We still hold events – namely the Cathal Lavelle Corporate Golf Challenge and our annual lunch but the aim of these events is to raise profile and to cover administration costs. Our core fund-raising is based on planned giving – simply having Patrons commit to multi-year contributions without us having to recruit time-scarce volunteers to run charity events while giving the charities the assurance of multi-year support. How did you get involved with basis.point? 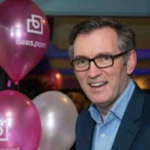 basis.point founders Adrian Waters and Eimear Cowhey pitched the idea of a fund industry charitable initiative to me and I was immediately sold. I thought that their sales patter could do with a bit of work though and they said – why don’t you do it and the rest is history! What changes have you seen since you came on board basis.point? As I focus on fund raising efforts, I’ve had the opportunity to focus on a variety of different initiatives. The Board of basis.point has set us very ambitious targets for our fundraising endeavours which we continue to work hard to achieve. By any charitable measure, we have been extremely successful as a start-up charity which has been in the most part due to our driven group of patrons and volunteers. One of the biggest changes I’ve seen in basis.point is the continuing growth of this patron and volunteer base. Our income is also boosted by one off donations from industry firms or from funds that are in wind down. In 2016, we gratefully received such donations through the good offices of ML Capital, BNP Paribas, Sanne and Peter Blessing. Where do you see basis.point in a year’s time? It’s a case of a lot done, more to do. We are only scratching the surface but we are dependent on our volunteers. We are extremely lucky to have a great team of heavy hitters on the Fundraising Committee from the likes of John Donohoe of Carne, Mike Hartwell of Deloitte, Killian Buckley of Duff & Phelps, Anne Keys of The Panel, Bronwyn Wright and Adrian Waters. My job is to ensure that they “reach” as many potential patrons as they can in 2017 so that we can pass the €300,000 barrier. It would also be great to have more volunteer help.